REVEYE drives customer interaction by giving you the tools to pro-actively engage with each of your members at home, in your casino and even at a table or slot machine. Our software tracks customer data and spending so that marketing dollars are spent on the most profitable customer segments and away from those you were unaware were unprofitable. Send targeted messages via text, email and other channels directly from the player’s club database e.g. automatically send a birthday text or email and based on players frequency and total gaming revenue, reward accordingly. User friendly software enables marketing staff to analyze guest information and create guest lists they can use in their marketing campaigns e.g. select all high rollers that have not visited in the last two weeks and send them a message. Measure the effectiveness of all campaigns with reports that track key performance indicators e.g. was the call to action read, shared with friends or redeemed. Users become expert campaigners within months as a result of being able to measure and improve their messages. Give guests a great experience even before they arrive at your casino by sending them relevant information and formatted for the device they use to read your messages. Have access to a team that have years of experience creating visually compelling digital content for the casino industry. More and more customers are reading the marketing information you send them on their mobile devices. Make sure their reading experience is a great one! 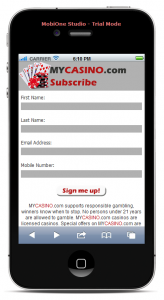 Our casino marketing software is aware of the device your customers are using to read your messages . The great experience begins before they arrive at your casino!